Apprising Ministries has been telling you that since the first Elephant Room there is a developing ecumenical magisterium. Now consider this Hang Out Online With Rick Warren And Me On Google+. 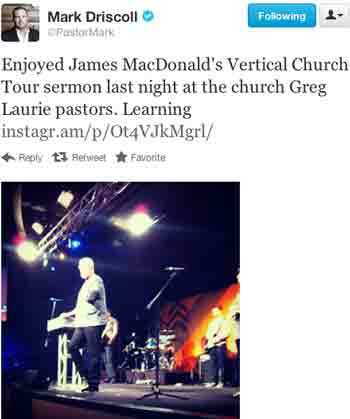 Greg Laurie is pastor of Harvest Christian Fellowship and is aligned with Calvary Chapel of the ailing Chuck Smith. Actually, there are many who do believe that Laurie is likely in line to take over from Smith. You might recall that Laurie was part of that first Elephant Room. We turn now to Greg Laurie’s Harvest America: Royal Route To Heaven, Rick Warren & The Message by Michael-Anthony Rene Chavez of Said Radio. 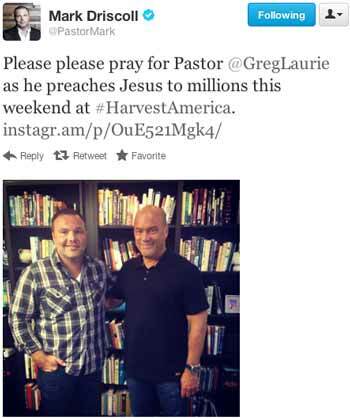 As saddening as it may come to some, we are strongly encouraging our audience of readers to not partake or invite your friends to Greg Laurie’s “Harvest America”. I have no problem acknowledging that I’ve heard him preach an unwatered Gospel message (dealing with sin, repentance, Christ crucified buried and rising again and His return.). As I told you in New Calvinist Mark Driscoll Hangout With Seeker Driven Rick Warren, what’s going on here is that Mark Driscoll is doing Hangouts with those aforementioned speakers the Acts 29 R12 conference. With a number of Seeker Driven stars, and Greg Laurie of rather anti-Calvinist Calvary Chapel, it seems an odd alignment of speakers for the New Calvinist Acts 29 Church Planting Network.